Soft chewy shortbread cookies are made from one shortbread recipe, with 4 cookie recipe variations. 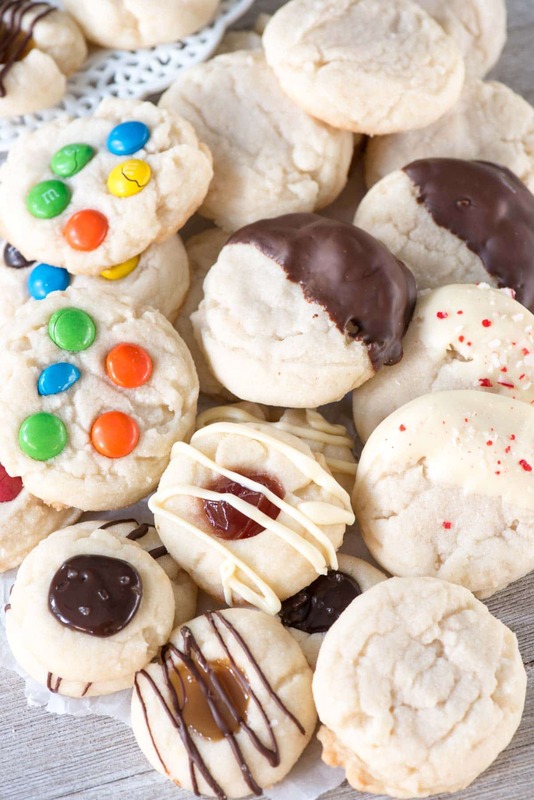 Add M&Ms, dip them in chocolate, or make shortbread thumbprint cookies! Throughout my entire adult life I have said I would NOT EVER buy a fake tree, NO NOT EVER. I would ALWAYS get a fresh and pine-smelling tree. I have loathed fake Christmas trees pretty much my entire life, probably because every other year we used one when I was a kid and the fake trees from the 70s were not like the ones you get today. That tree was more like a Charley Brown Christmas tree than a real one. So what changed my mind? A friend and I were chatting and she was talking about putting up her tree early and how they have a fake tree and the lights are already on it and it’s up and decorated in mere minutes. And suddenly all my reasons for hating fake trees started to seem weak. When Jordan was a baby we’d go to the Christmas tree farm and cut down our own tree, cups of hot chocolate in hand. Then we got a little lazy and discovered that Home Depot had great trees so we’d venture there instead. Then we got rid of our truck and we started having to strap the thing to the top of the car as well as drag it in and make a huge mess of needles. The entire month would be a battle of remembering to water the darn thing and wondering if it would fall over (it did, one and a half times). Then the clean up and the needles I’d find well into April. Also, did I mention that fake trees come with the lights on already? That’s the absolute worst part of tree trimming, right? The lights? I asked Mel, figuring he’d be anti-fake tree. “It’s okay with me if it’s okay with Jordan,” he said. Now I can sip my wine and look at my gorgeous 600 LED bulb Christmas tree…and change the color from white to multicolored with the click of the foot pedal. So are soft chewy shortbread cookies, especially when the dough is one recipe you can make four different ways! 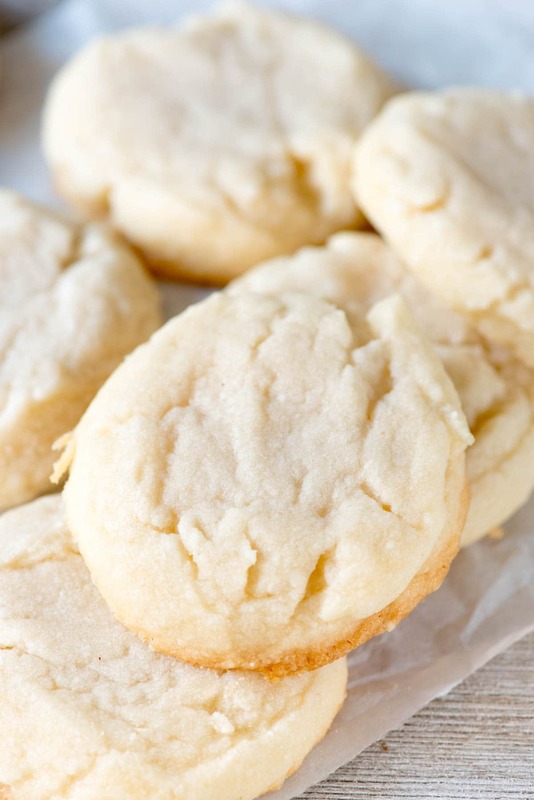 This soft chewy shortbread cookies recipe started in my mind last year when I made these cookies. Those were from a mix, but it’s a mix I absolutely adore. The problem is: you can only get it at the holidays. What if I want shortbread cookies in March? Sure, I have a shortbread cookie recipe, but it wasn’t like that mix. I can’t really explain the difference except to say the mix results in a cookie that’s soft and chewy and shortbread all at the same time, whereas normal shortbread cookies are more like a sugar cookie in texture. I wanted a cross between a drop sugar cookie and a shortbread cookie recipe…and that’s what these are. It only took me three tries, but I got them PERFECT. They melt in your mouth, are soft and chewy at the same time, and so buttery they’ll make you cry tears of powdered sugar. How did I do that: a combination of butter and oil (the oil gives them that chewy soft texture I was looking for) as well as using powdered sugar instead of granulated (less spread, because powdered sugar has cornstarch in it). Also, these have no eggs and no leavening! Once I had soft chewy shortbread cookies, I started thinking…there are SO MANY ways to use this recipe. I mean, that picture above is pretty, but basic shortbread cookies are a little boring. Where are the sprinkles, the chocolate, the frosting? And that got me to thinking…why not show the ways I can use this cookie dough? It’s one cookie recipe you can turn into 4 different cookies all at once or in different batches. Basically, this one recipe can satisfy all your holiday platters in one fell swoop! I can’t ever get enough of M&Ms in cookies. It’s probably why these cookies are so popular; the M&Ms shortbread cookies are so festive. You can use any kind or color M&M on these cookies, for any holiday. 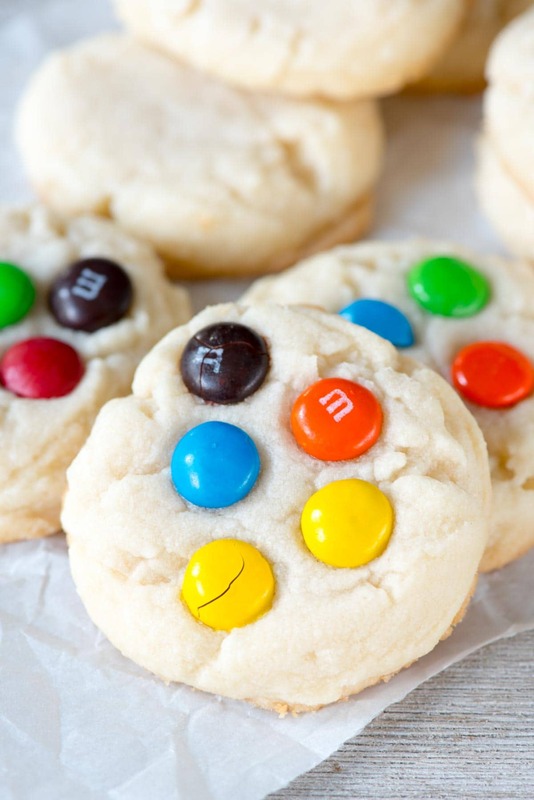 You scoop the cookie dough and then press the M&Ms on before baking. Easy, right? 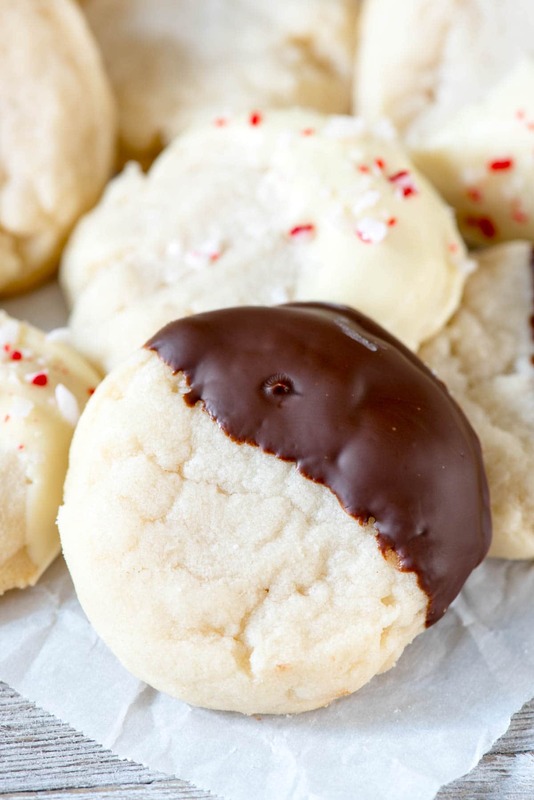 Then, the classic way to dress up shortbread cookies: with chocolate! I think chocolate dipped shortbread is so pretty. You can dip these in anything you like, but I like using semi-sweet or white baking chocolate. Those are the ones you find in the baking aisle, usually on the top shelf. They come in 4 ounce packs. Melt a 4 ounce bar and dip each cookie halfway. Decorate them with peppermint pieces or toffee bits or nuts or sprinkles, or leave them plain. The peppermint ones add some pretty color to a holiday platter! And last but not least: thumbprint shortbread cookies. I always love thumbprints because they look difficult even though they’re super simple. I rolled 1 tablespoon sized balls of dough and made a “thumbprint” before baking using wooden spoon handle. Once they bake, I fix the hole a little if needed (sometimes they spread out or close up while baking). Then fill the with your favorite filling: jam or chocolate or caramel. Just use any kind of jam you love, or use ice cream topping. That’s hot fudge with some sea salt in the back and salted caramel ice cream topping in the front. I drizzled them with a little melted chocolate just to make them look pretty. 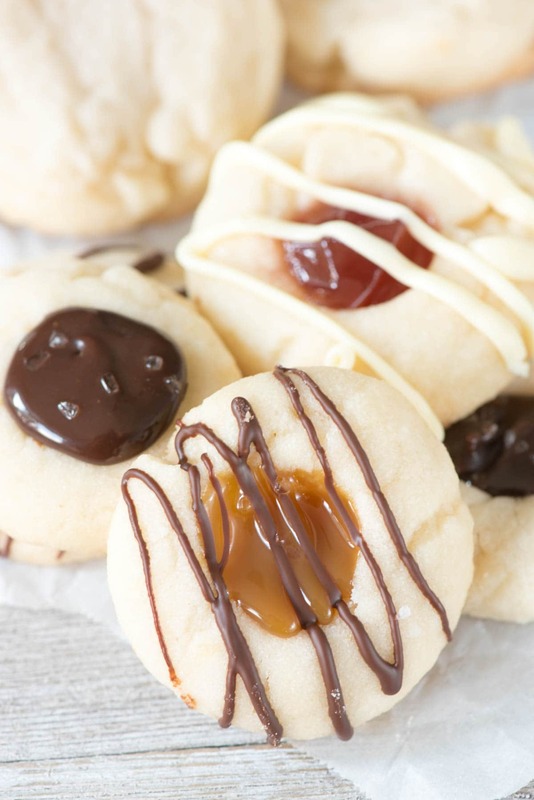 So many options…one soft chewy shortbread cookie recipe. Which one will be your favorite?? Soft chewy shortbread cookies are made from one shortbread recipe, with 4 cookie recipe variations. Add M&Ms, dip them in chocolate, or make shortbread thumbprint cookies all from one recipe! Preheat oven to 350°F. Line two cookie sheets with parchment paper or silicone baking mats. Beat butter and oil with a hand or a stand mixer, then slowly mix in powdered sugar and salt. Slowly add salt and flour and mix until a thick dough forms. This will take awhile with a hand mixer! Scoop 1 or 2 tablespoon sized balls of cookie dough onto cookie sheets. Flatten slightly with the palm of your hand. Bake until the edges just turn brown and tops are just no longer translucent (2 tablespoon sized cookies: 10-14 minutes, 1 tablespoon sized cookies: 8-12 minutes). Cool completely before removing from cookie sheets. Store in an airtight container for up to 3 days or freeze for up to one month. For M&M Shortbread Cookies: add M&Ms on top of the cookie dough ball before baking. For 2 tablespoon sized cookies, I suggest using 5-6 plain M&Ms, any color. For Chocolate Dipped Shortbread Cookies: melt 4 ounces of white or semi-sweet baking chocolate according to package directions. Dip cooled cookies halfway into chocolate, tapping off the excess, and then place on a wax paper lined cookie sheet and chill until hardened. Sprinkle with crushed candy canes, toffee bits, nuts, or sprinkles while still wet, if desired. 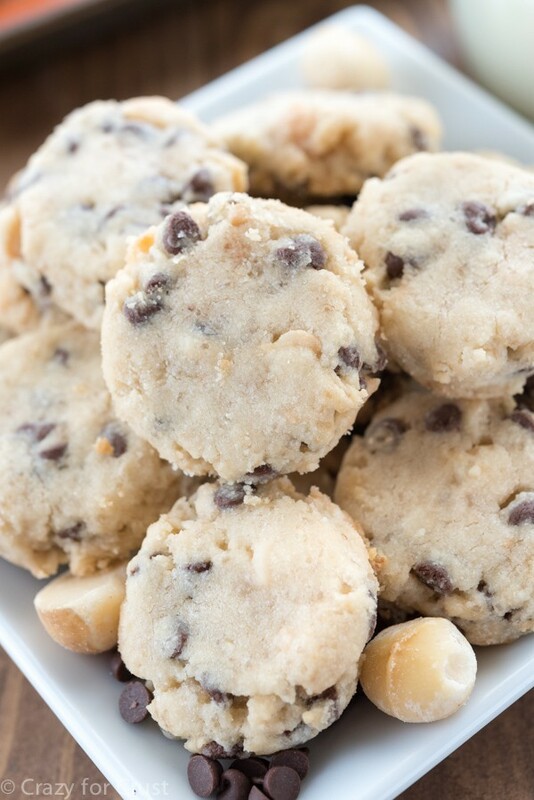 For Thumbprint Cookies: make 1 tablespoon sized balls of cookie dough. Roll them between your hands to form a ball. Use the back of a wooden spoon to slightly make an indent in the center of each cookie. Bake until lightly golden on the bottom (8-12 minutes) and then re-press hole with the wooden spoon handle as needed. Cool completely. For filling, fill with about 1/2 teaspoon of jam, cold hot fudge ice cream topping, or cold caramel ice cream topping. If desired, melt some dark or white baking chocolate to drizzle over the top. 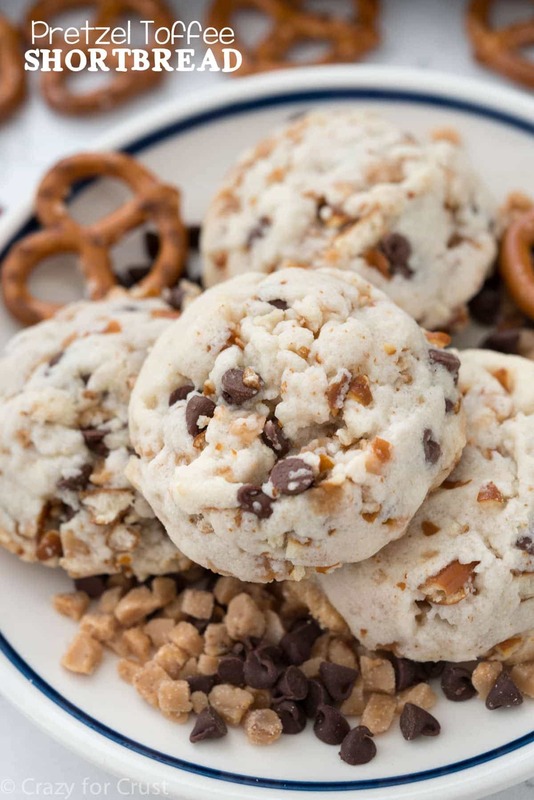 These cookies would also be great to make my Chocolate Chip Toffee Pretzel Shortbread or my Macadamia Nut Chocolate Chip Shortbread Cookies! Hi Dorothy! Just following up on my sprinkle question..I tried rolling these guys in sprinkles but the sprinkles did not stick well at all! I then tried dipping them in some egg whites before rolling in sprinkles and that did the trick 🙂 They turned out great! Can you make the dough ahead and place in the fridge? We’re currently baking salt dough ornaments so the oven is preoccupied. We’re taking these to our angel’s school program tomorrow. thanx so much for sharing this wonderful recipe. I just made these and was quite disappointed with the taste – very oily taste. They’re cute in your pics, though! Hi, can these be stamped or used with a cookie press? Thanks for sharing, I haven’t made it yet. Just made them. Really yummy but not even a little bit chewy, very dry and crumbly, fall apart. What did I do wrong? Could it be a high altitude thing? I had the same problem with another of your cookie recipes I tried. I can’t figure it out, I followed the directions exactly for both of them. Simple & oh so buttery delicious. these little gems are great as is, or dressed up… so versatile. Just got done baking my first batch of these chewy, delicious shortbread cookies. They turned out perfectly. Hubby and I loved them and I’m hiding the rest from the kids. ? I LOVE soft cookies! I have a shortbread pan that I have been wanting use, would the cookies turn out alright if I baked them in it? I tried these shortbread cookies and there is not enough to hold the dough together. Is there something missing.